Firebug 1.10 introduces new API for building extensions based on Asynchronous Module Definition (AMD) syntax. Firebug itself is already using AMD to improve its internal structure and modularization of the code base. The Asynchronous Module Definition (AMD) API specifies a mechanism for defining modules such that the module and its dependencies can be asynchronously loaded. One reason why Firebug uses AMD syntax is to support module sharing between Firebug and Firebug Lite. This post explains how to build Firebug extension based on AMD. Firebug 1.7 (currently beta 1 available) improves API related to Infotips. These Infotips are used in Firebug UI for displaying additional information. They are similar to tooltips but can provide a richer content (comparing to those in HTML). The content doesn't have to be only a text but any HTML. In fact, the content is usually generated using Domplate. Let's see how to utilize these Infotips in Firebug extensions. First, see how infotips actually look like. Since they are implemented in HTML and Firebug uses HTML only for panel content (so far) they appear in panels. The first image comes from the Script panel. The mouse is hovering over a variable and the infotip shows its value. The next infotip is displayed within the Net panel. 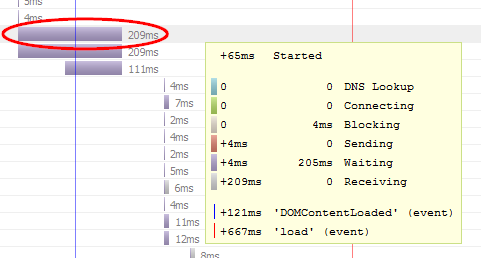 It shows detailed timing info for selected (note the gray background) HTTP request entry. And the last example shows preview of an image when the user hovers mouse over a CSS property with background URL. Firebug inspector is certainly one of the most valuable Firebug features and it also deserves more attention from extension developers. From this reason Firebug 1.7a10 introduces a new API that allows reusing this feature in Firebug extensions and customize its behavior. 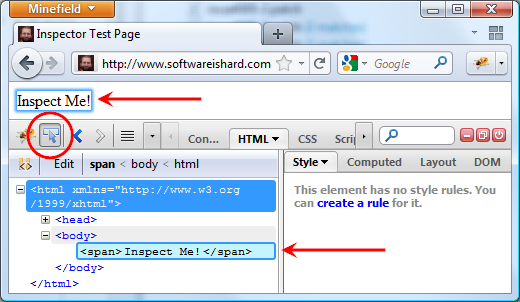 This part of Firebug extension tutorial explains how to use this API in Firebug extensions. Let's see a quick overview of what is actually the Firebug inspector and how it works from the user perspective. Clicking on the inspector button starts an inspecting mode. As the user moves the mouse cursor over page elements, they are automatically highlighted. 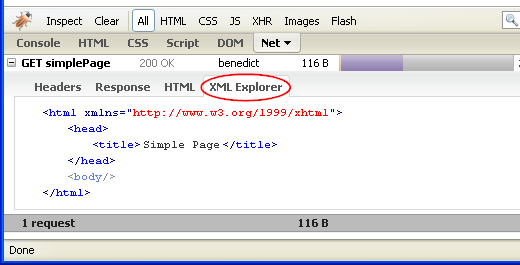 The HTML panel (selected by default) shows detailed information about the currently highlighted element. The inspecting mode can finished by clicking on the inspecting page element or canceled by pressing ESC key. It's been a while since I published the last part of my Extending Firebug Tutorial and it looks like it's time to continue. I have been inspired by an interesting thread started recently on Firebug newsgroups and I decided to write a part related to Firebug Activable Panels and Modules. There are two ways how to enable (or disable) a panel. The first option is to use the mini tab menu available next to the panel's label. The second possibility is to use the status bar icon menu (be careful this UI will most likely change in Firefox 4.0). So, if you are a Firebug/Extension developer read more about activable APIs and how to create an extension with an activation support. Since fresh new Firebug 1.4a13 - the Net panel introduces, among other things, several new events that allow to easily collect all network requests and also related info gathered and computed by Firebug. This functionality should be useful also in cases where Firebug extensions want to store network activity info into a local database or send it back to the server for further analysis (I am thinking about performance statistics here). So, if you are interested to see a simple example that shows how a listener should be implemented and registered within the Net panel read more. 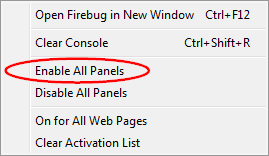 One of the new features introduced since Firebug 1.4a2 is possibility to extend Net panel with additional info. There are new APIs that allow to create a custom info-tab for network requests (like Headers, Params, etc.) from within a Firebug extensions. This post is intended (a) to show how these APIs should be properly used by Firebug's extensions and also (b) to gather some feedback about the architecture. So, let me know please, if there is something I haven't thought about when designing this new extension point. Even if this part is also about web services integration, the main purpose is actually to show another (and a bit more complex) example of Domplate usage. In this part I have used Yahoo! Search Web Services to track inbound links and demonstrate how Domplate can be used together with real data. Final extension in this part will discover what pages link to the current page in the browser. One of the most interesting parts of the Firebug framework is a template system called Domplate. This engine is used to generate HTML UI of Firebug (content of all FB's panels). It's quite powerful template system and I would definitely recommend to use it when creating UI for Firebug extensions. It's also possible to define DOM event listeners so, the template object can handle even the user interaction with the final UI. I have already mentioned a few times that we'll take a look at how to properly localize our extension. Even if the process is nothing new for experienced extension programmers, I think it should be part of this tutorial. First of all, let's extend our directory structure. We'll need a new place where to put localized strings. To let Firefox know about these files, we need to modify our chrome.manifest file and append following line to it. All strings in our helloWorld.xul are localized using helloWorld.dtd locale file. This DTD file contains list of entities with corresponding localized strings. In our extension we have to localize just a toolbar button. So, we need two following entities defined in it. In order to use these entities within the helloWorld.xul file we have to create a reference to the locale file. Sometimes you need to reference multiple DTDs from single XUL file. Here is an article that explains how to do it. Now, we have to replace the strings by the entities that comes from the locale file. Following source code shows how the toolbar button definition looks after the replacement (see label and tooltiptext attributes). See chapter 11. Localization from Creating Application with Mozilla book for more information about string bundles. The other way is to define the bundle in helloWorld.xul, using stringbundleset and stringbundle elements. This method is simpler and used in our extension. Following source code shows how the $HW_STR method is used to localize Options menu items defined in the previous part. If you need to put some dynamic values into the localized string use the $HW_STRF method. This method takes an extra parameter - array of arguments, which are substituted into the string in the bundle. See the following example how to use it. helloworld.formattedstring=Here is a value: %S and here is another: %S. If you are interested in more details how to properly localize Firefox extensions, read this article. Example extension (helloworld-0.0.4.xpi) can be downloaded here. I have finally got some time to write another piece of the tutorial. This time I’ll explain how to use an Options menu that is available in every Firebug’s panel. This menu is located at the right side of a tab-bar. The main purpose of the menu (as the name clearly indicates) is to expose panel-specific options (preferences), so the user can access them and change theirs value if necessary. The menu is already built within Firbug’s UI. So, all we have to do is to provide a content. This is done by getOptionsMenuItems method that must be implemented in the specific panel object (i.e. HelloWorldPanel in our case). This method is called by the framework when the user clicks on the Options menu - just before it’s displayed. Each object returned in the array represents a menu-item. Following properties are supported. label (string) The label that will appear on the menu item. Specifies type of the menu. checked (boolean) Indicates whether the element is checked or not. disabled (boolean) Indicates whether the element is disabled or not. image (image URL) The URL of the image to appear on the menu item. command (js-function) java script menu item handler. *) This is only for strings coming from firebug.properties file. Should be always set to true for third party strings. ... and put them into a prefs.js file, which is located at proper location within extension's directory structure. Now, see new implementation of the getOptionsMenuItems method, which displays both new preferences and makes possible to change theirs values. As you can see, there is a new helper method optionMenu that creates a menu-item object. The method takes two parameters: a label and a preference name. Notice that menu-item-separator is created just with simple "-" string. 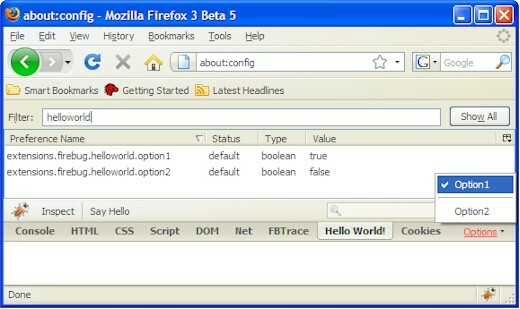 This example considers Firebug 1.2 (these methods are different in 1.1). The usage is quite obvious. The first parameter is used to specify preference domain, the second specifies preference name and the third - new preference value. The domain should be "extensions.firebug" (there is a constant Firebug.prefDomain for that). Further, there is a new bindFixed method. Could sound familiar to you as this pattern is often used in JS libraries (e.g. Prototype). In this example, bindFixed is used to bind a method (Firebug.setPref) to a handler (command), with three parameters (Firebug.prefDomain, option, !value). Finally, if you want to test it, don't forget to open the about:config page in order to see how the preference is changing. The extension can be downloaded here (you need Firebug 1.2 ).